In marketing, while size and reach are very important, the quality of followers is JUST as valuable. Passing off “fake” numbers will only get an agency, or influencer so far. To have longevity you need to show true conversion, and that can only be done with real influence. As a blogger (or a brand account) you can knowingly or even UNknowingly commit some of these illegitimate actions that will create an inauthentic foundation for your brand. It can make you seem “bigger” and “better” than you are, but in the end will lead to your demise. You will NOT be able to convert at an accurate % with an account filled with spam. There are a load of crappy websites that provide dirty advertising in unethical ways, and if you want to hang your hat on that peg, I say good luck and good riddance, as I won’t be visiting your site. Premium advertising comes at a premium price, and I for one want to be in THAT club! Which means I need to deliver a premium service. With real people reading my content and engaging with me. And NOT inflating my numbers. So, how can you tell if you are Legit? But, this means NOTHING if your followers aren’t REAL. Twitter Audit – Pop in your twitter handle and twitter audit will measure how many of your followers are REAL and how many are FAKE. If you have spam accounts (and trust me, everyone has some) try these platforms to easily rid your account of this slime! Fakers – Status People has a cool platform that identifies and gives you a button to easily BLOCK your fake followers. It is a couple bucks a month for a subscription, but worth it if you find yourself suddenly slammed with spammers. A healthy looking Twitter Handle! Also, pay ATTENTION to your followers. Accounts with high following, and low or NO followers and no bio are USUALLY spam! Report, and BLOCK these accounts to maintain the integrity of YOUR asset. 1. Restrict the demographics of your page. If your followers are coming from one geographic location, restrict that country for a little while. 2. There are some platforms that can remove these spam accounts for you, but I have not used any myself. Explore at your own risk! Again, checking on your page insights regularly is important! Keep track and reverse spam hits as soon as they happen so that it doesn’t become overwhelming. Having high pageviews means NOTHING if they aren’t REAL! There are a variety of spam and scraping bots that will drive traffic to your website, often without you knowing it, or having done anything to make it happen. As much as having high stats is great, it still doesn’t mean anything unless they are REAL! Use a reliable platform to measure your stats! Google Analytics eliminates ALOT of the spam compared to other analytics platforms, but some will STILL get through. Ghost visitors are a type of spam that never actually VISITS your site, it just mucks up your analytics. I have seen sites that are getting almost 30% of their traffic from these types of spam, and that is bad news for both influencers AND brands who are investing. How do you check to see if your visitors are real? 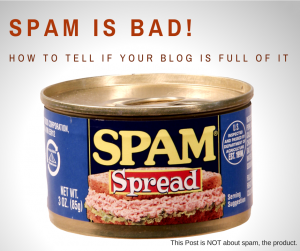 IF you see sites referring traffic to your blog that you do not know; it is probably spam. IF you see referrals like trafficmonetizer.org, floating-share-buttons.com or www.Get-Free-Traffic-Now.com, you have spam. What can you do about it? Well, it’s tricky! I love this site that explains how to create Google Analytics Filters, and here. This can be tricky stuff though, so it may be worthwhile having your web team or a web master do it for you. One thing you need to remember if you find that your followers are filled with spam, robots and fakers, this probably wasn’t YOUR FAULT. The internet can be a crappy place, filled with sneaky ways to advertise or cheat. Playing the ethical game can be time consuming, but in the end, it will be worth it! IF you are tagged as being more spam than good, odds are your chances of working with reputable companies will diminish. Brands want to work with true influencers, and the only way you can do that is to be it. Lastly, try to decrease the number of inactive accounts and platforms you have. If you sign up for something, USE IT. Check in regularly and start taking a temperature of the account so you know what is normal and what would raise a red flag. Just by monitoring these few things you can run a healthy business, filled with real people and real opportunities!